Red Nose Day (COMIC RELIEF) will be on Friday 15th March. We will be selling red noses during that week. We are only ordering 5 boxes of 40 noses so it will be first come, first served. 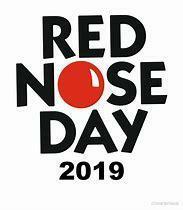 On Red Nose Day, there will be a Tag Day with the theme: There will be a 50p donation expected for the privilege of coming to school in your own clothes! We would like to invite parents to have some fun too. So, on the evening of Thursday 14th, we will be holding a QUIZ NIGHT. It will start in the School Hall at 6– 6:30pm and you will be allowed no more than 10 people in your team. More information will be given to you after half term so, if this interests you, put it into your diary. Attached to this letter is another chance to raise a little bit more cash, for the event. If every child stuck 5 pennies on their person between now and Red Nose week, we would raise over another £20 which pays for one night of care for a homeless person in the UK, one session of employment advice for the unemployed or four mosquito nets, for families who are losing children to malaria, in Africa. There will also be an AFTERNOON TEA, 2:30 – 3:30 in the School Hall on Red Nose Day. We are hoping that all of these events and activities will be an exciting chance for the children to have fun and help others at the same time. We know how supportive you are of your children, and the school, and we hope that giving you this information early is useful.